We know that the I/O Pin of Raspberry Pi is limited. So Raspberry comes with LED dot matrix screen, it would be more trouble. But use special LED constant current control chip, basically only takes Raspberry Pi SPI interface (3 IO + 2 enabled) you can control 64 LED lights. LED dot matrix drivers become possible! 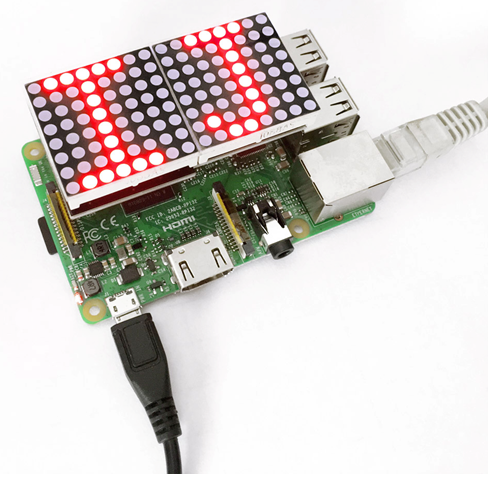 This dot-matrix-led-display module is compatible with any version of Raspberry Pi. We will provide you with installation package, source code and quickstart guide PDF to help you step by step, so don’t worry! Plug it directly into Raspberry Pi to start your works as shown in below figure. Here is the tutorial for installing bcm-2835 library in Raspberry Pi. To install bcm-2835, first we need to download bcm2835 library. So we will provide an installation package or click its office web http://www.airspayce.com/mikem/bcm2835/ to download it. Step1: Now after downloading library, copy it in any folder of your raspberry pi by winSCP(we provide its installation package, but please refer to usage by yourselves). Congrats your library is installed. Now use “#include <bcm2835.h>” in your program to use bcm2835 library. Now its time to write a program. Copy the file rpi_Dot-matrix provided by us and put it into the directory rpi_shield through winSCP. 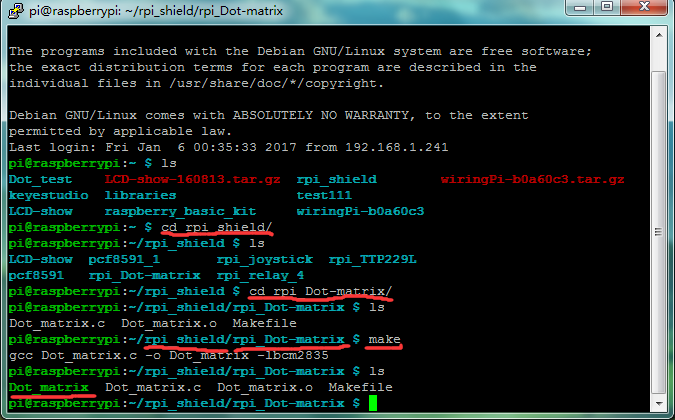 Next, type this command: cd rpi_Dot-matrix to go inside the rpi_Dot-matrix folder. Then type this command: make to make an executable file. This means this is the file we run to launch the program as shown in below figure. Finally type this: sudo ./Dot_matrix to launch the program. 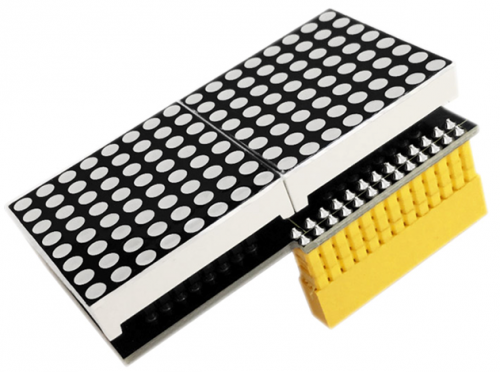 The dot matrix will display letters “IJ” as shown in below figure. Use Ctrl+C to exit the processing program.